That last day was torture for me and filled with indecision. But I knew when I saw bloody urine there wasn’t much hope. I had wanted to wait a few more days to see if the cortisone injections Dr. Doni had given her directly into the knees of both back legs worked. But I couldn’t torture her anymore. And I believe she let me know the time was right. She would lift her head every so often and bark and then her head would flop down. She surprised me by eating a bit, but it was false hope. I stayed by her side all day trying not to cry, telling her how much I love her, how my heart hurt, how much guilt I felt and still do, to have to make this dreaded decision. I clipped a bit of her fur to keep close to me always. When Dr. Doni came I held her and gave her many kisses and whispered to her how I love her and those were the last words she heard. It was over in a matter of seconds. Earlier in the day a friend’s son helped me dig her resting place in my garden. It was her favorite spot under a shady pine tree where she could survey her domain and keep watch over all. Dr. Doni carried her and gently laid her down. He was kind enough to help cover her grave. I don’t want to concentrate on Timo’s cancer because she was so much more than to be defined by a disease. But I just want to add that both Dr. Doni and I suspected that the cancer had returned or never left. On x-rays, her arthritis was not severe, certainly not enough to cause her to lose the use of her back legs. Timo went to the Rainbow Bridge 9 days short of her 9th birthday, August 1st. Timo, you are my hero. You fought long and bravely. You are my Angel now and I know one day you will race across the Rainbow Bridge whole and well, with all my Angel pets to greet me again. The love and loyalty you’ve given me doesn’t vanish. My precious Timo, you live on in every beloved pet that must fight this beast cancer. And I will continue to write remembrances of you through my tears. My daughter Rena was kind enough to set up a memorial for Timo at http://www.wearethecure.org/friends/MemorialforTimo. It is part of the National Canine Cancer Foundation whose goal is finding better treatment and a cure for canine cancer. Anyone wishing to contribute may do so at the site mentioned. Wednesday, August 12 It’s been 21 days since my Timo was laid to rest. 21 very difficult days. The tears just don’t stop. There is always something to remind me of little things about Timo. I have 2 apple trees in my garden. One of them only gives wormy apples, probably my fault since I don’t take care of it the way I should. My grandkids are visiting this week. I asked them to clean up the fallen apples that were making a mess of the garden. While looking for something to put them in, I found a coin at the bottom of the bag I chose. 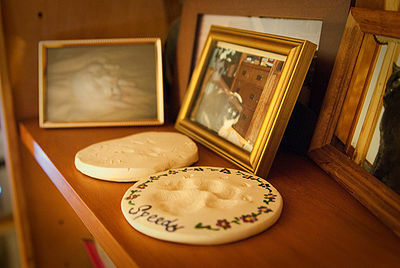 Members of the groups I belong to feel that finding these coins are like “Pennies from Heaven”, signs from their beloved dogs who have crossed the Rainbow Bridge. I like to think the coin I found is a sign from Timo, telling me she’s fine now and that she’ll continue to watch over us. Timo, I love you so and I miss you so much. Wednesday, August 26 – I’ve been in touch with Ana of the BCD and will set up the link to this site on the BCD site. It’s been 34 days now since Timo crossed the Bridge and the pain is as sharp as that fateful day, July 23rd. Timo would have enjoyed these sunny days of summer. She loved to sit outdoors and sun herself. I often had to call to her because I felt it was just too hot to be out in the sun for long. 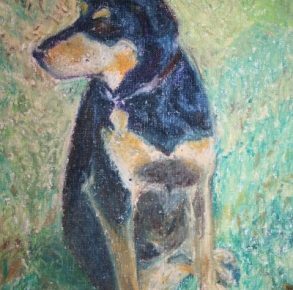 As I wrote on “Memorials for Pets” on The PetWiki, my granddaughter, Shira, our artist in residence, painted a portrait of Timo from a photo. It will have a place of honor in my home. Thank you Shira. My family mourns Timo’s loss as well as I do. Monday, September 14– Today is day 43 after Timo crossed the Bridge. Yes, those of us who have lost our beloved pets measure time as before that day and after that day. Not a day goes by that I don’t feel her loss and find tears running down my face. Last week, my daughter Rena took me along with a friend to an animal shelter. I had no intentions of coming home with a pup. Actually I went because my friend wanted another dog. Of course she didn’t find what she was looking for, but I found one. 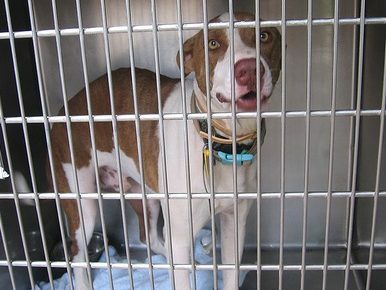 It was so heartbreaking to see all those dogs behind bars, I broke down and wept. Rena really chose Murphy – she fell in love with her. We were hoping that her cats would accept Murphy and she could live at my daughter’s house, but of course that didn’t happen. I’ll continue walking Murphy there and perhaps the cats will become accostomed to having her around. Murphy is a mixed breed, really mixed, who knows what she is; she’s one year old, brindle and white coloring and weighs between 30 and 35 lbs. I was concerned about my 110 lb. GSD Quanah getting along with her. But it turns out that Murphy has pulled Quanah out of her depression at the loss of her pal Timo. I wish Murphy could do the same for me. She’s very loving, follows me wherever I go and even sleeps with me. The vet at the shelter told us that Murphy was very calm and quiet. Needless to say when we got her home, it was as though someone pushed a button and quiet, calm Murphy became a very lively, somewhat noisy addition to the household. I’m happy though to see Quanah back to her old self. I just hope Murphy doesn’t wear her out. Tomorrow Murphy has a vet appointment to be spayed. Hopefully all will go well. Timo, you’re still my special pal, no one will take your place. But I hope you know I did this to save another dog. Friday, October 9 – Well, 2 months and 16 days have passed since I lost my dear Timo. The memories are still painful, they may never go away, and the tears still come. But Murphy has brought life to the house. Her spay was without incidence and she was jumping about the next day. Nothing keeps her down. However last week she angered me deeply. I know she didn’t know what she was doing, but I found her digging at Timo’s grave. I think the look on my face was enough to frighten her and she was quiet the rest of the day. I fixed Timo’s grave and have more work to do on it. I have to remember only Timo’s body lies there, her spirit is with me always. Murphy has since recovered to go on to break other things. But she’s only a pup and will outgrow this stage (I hope). Wednesday, October 14– Today I learned something very disturbing about chemotherapy. As I’ve written before, I belong to 2 yahoo dog cancer groups – Bonecancerdogs and Caninecancer. I read a member’s post on BCD that one of her dogs suffering with osteosarcoma lost the use of her back legs after the usual doses of Vincristine, a chemo drug. A light went off in my head and I posed a question to the group asking if the chemo drug Carboplatin (Timo’s chemotherapy drug) could also cause the problem. And to my surprise and regret the answer was yes. Though it’s not something that happens often, it should be noted. Since x-rays showed no mestastases or arthritis bad enough to cause Timo to lose the use of her back legs, I must conclude that the Carboplatin is a strong candidate. If the cancer mestasitized to the spinal chord, it would not show up on x-rays. I will never know the real cause, but I think if I had known these facts I might have chosen a different course of action. But hindsight is always 20-20. And I know everyone did what they could. I blame myself for not being more knowledgeable and asking more questions. You are the only one who can be an advocate for your dog. Don’t be afraid to ask questions constantly. Joining these groups will help with ideas of what to ask your vet/oncologist/holistic vet. My dear Timo, I hope you know what I chose for you was out of my deep love for you. I carry you always in my heart. Friday, October 30 – We had our first real rain of the season today and all I could think of was how my Timo disliked this weather. It was thundering this morning and I hope she wasn’t afraid. And then I thought she is in a place of sunshine and green grass and pretty flowers, romping with friends or resting under the shade of a welcoming tree. Nothing to frighten her while she waits for me. Monday, November 2– I finally put the living room rug down again for the winter. Reminds me of when I take out the vacuum or carpet sweeper, Timo would leave the room. She wasn’t afraid of them, she just didn’t like the noise. And Quanah and Murphy sharing the couch reminds me of Timo. She didn’t like to share her sleeping or resting place with anyone. If Quanah jumped up on the couch beside her, Timo would make a quick exit to find another spot. So many things to remind me of my dear Timo. As if I needed reminders. Wednesday, November 25 – Yesterday marked 4 months that my dear Timo has gone to the Rainbow Bridge. And tomorrow is Thanksgiving. I’m thankful for the almost 9 years I had with my best friend. I remember when we used to sit at the table to eat, Timo would put her head on my lap, always acting like a lady. She would calmly sit like that waiting for a morsel of food. We made it a rule never to feed the dogs at the table, but sometimes, when no one was looking, I’d sneak her a piece of meat. Satisfied, she’d go to one of her favorite places and lie down. A few weeks ago, when Murphy was fairly new here, a strange thing happened. I wrote about it to my BCD and CCD groups and thought I’d add it to Timo’s log. I was out in the garden, hanging clothes out to dry, when suddenly, for no apparent reason, Murphy, who had been near Timo’s resting place, came running to me with her tail between her legs, very frightened. And for the first time Quanah sat down beside Timo’s grave. Murphy had been misbehaving earlier as usual. My friends in the group and I think it was Timo scolding Murphy. I like to think she comes back to visit. I’ve also experienced flashes of black fur twice, just for a second or two. I thought at the times that it was something with my eyes. But I’ve come to believe, since it hasn’t happened again, that it was Timo, again visiting. You may think what you like, but I know Timo is watching over us. Sunday, January 10, 2010 – I haven’t written in quite a while, but it’s not because I’ve forgotten. I will always miss Timo and she will always be with me. I received a notice from the post office that I have a package. The only thing I’m expecting is a calendar from the CanineCancer group I belong to. Timo is featured on the cover along with hundreds of other Angels and she’s also in the picture for the month of October. I’m anxious to see the calendar and it will have a prominent place next to all my mementos of Timo. Monday, January 18, 2010 – Finally picked up the calendar last Friday. When I opened the package, there was Timo, one of the Angels featured on the cover. It brought tears to my eyes, seeing her sitting there, smiling, her eyes always with a kind expression. Accepting of everything that she experienced. It took me 2 more days to open the calendar fully and look at Timo in the month of October. The calendar sits on a table next to the computer so I can glance that way and see Timo smiling always. My dear friend, I know you’re smiling across the Rainbow Bridge in that beautiful place. I decided to hang the calendar on the wall where I could more easily see Timo’s smiling face. When Timo was young I lived with my daughter, helping to take care of the kids while she worked. One day, while walking Timo and the other 2 dogs, I found 3 abandoned kittens. I began leaving food out for them until they eventually came up to my daughter’s garden. Timo accepted them and even played with them. This was so unusual as Timo chased most cats before. Try as I did, she never got over her dislike of cats. And when we came back home to live, Timo never befriended another cat. Thursday, March 18, 2010 – Another very sad day. Today at 4 P.M. I had to let my small terrier, Toto go the Rainbow Bridge to meet Timo. She was 16 years old this month. While she was not my “heart dog” she gave me 16 years of loyalty. She was snappy and even bit me a few times, but I know she loved me and I wish I had shown her the same love. Timo knows her well and I hope she takes good care of Toto. Toto never befriended another dog after my German Shepherd, Samantha, went to the Bridge. I hope Samantha is there to meet Toto too and all the Angels will welcome her. Rest easy Toto, your suffering is over. Run free! Sunday, April 4 – Spring is definitely here and my dear Timo’s grave is becoming overgrown with grass. So today, I started clearing the area, preparing for planting some pretty perennials. Quanah and Murphy have eased the sharp pain of not having Timo physically beside me. Oddly enough, before I cleared Timo’s grave, Quanah was sniffing around it. She knows where her dear friend’s body lies. But always, Timo’s spirit is with me. Friday, May 14 – Last Sunday was Mothers Day and my daughter asked what I’d like. I immediately thought of plants for Timo’s and Toto’s graves. The graves are covered with large rocks and around each one I formed a heart with some lovely white stones I purchased. I have also since put in the plants. I’m not quite finished, but oh, it was a labor of love. It’s almost 10 months since Timo went to the Bridge and almost 2 months for Toto. I talk to them every day and that brings me a measure of comfort. As the Garth Brooks’ song says, I could have missed the pain, but then I would have missed the dance. Tuesday, May 25 – Sunday, May 23rd was Timo’s 10 month anniversary at the Bridge. It was a difficult day for me, too many tears. The flowers around Timo’s and Toto’s graves are doing well. I carefully tend them and make sure Quanah and Murphy don’t disturb them. Springtime means Quanah is losing her thick undercoat. When brushing her, so much fur comes out, it’s almost as if I could make another dog with it. Another bittersweet memory – Timo would love to catch the clumps of fur when I brushed Quanah. Lots of fur to catch over the Bridge – too many pets gone too soon. Sunday, August 1 – Today Timo is celebrating her 10 Birthday. But it will be a celebration at the Rainbow Bridge with all the other Angels. Happy Birthday my sweet Angel. A week ago Friday, July 23rd marked a year that Timo made the journey to the Bridge. In my sadness, I couldn’t write then. How quickly time passes regardless of emotions, happy or sad. Last night the CanineCancerAngels yahoo group I’m a member of, had their annual candlelighting ceremony in Maine at the home of Pam, one of the owners of the group. Those able to attend lit candles for their beloved Angels and for friends Angels at the appointed time. Those of us around the world lit candles at the same time although we are all in different time zones. There were candles lit for our Angels and candles lit for our furpals still battling cancer. I’m sure we lit up the world with the love and light shining from close to more than 500 candles. Candles were lit at my house at 12:30am for Timo, Toto, one for all my beloved pets that are at the Bridge, for those still in the battle and one each for special friends Dana & Bullet. Timo, I’m sure you and all your many pals were watching and know that no matter how much time passes, you are missed and loved and will always have a special place in my heart. Monday, November 8, 2010 – It’s been a while since I’ve written, but never forgotten, enjoying a fond memory every day. Today is my birthday and I feel my precious Timo sharing this day with me. Her grave and Toto’s grave are the first stops I make every morning when I go out to the garden. I always feel them close to me and they warm my heart. Hug your pets every day and love them – they leave us too soon. But as a child once noted, perhaps G-D takes them sooner because they already know goodness. Wednesday, January 12, 2011 – Finally received my 2011 calendar from CanineCancerAngels. Timo is one of the Angels on the front cover and also on February’s and September’s and October’s pages of Angels. I wish I could say that I can think of her and talk about her without tears, but it’s not possible. Losing Timo has brought back memories of all my 4-legged Angels. New treatments and supplements are available now, clinical trials going on in many veterinary universities that I hope people will take advantage of. But cancer continues to be the No. 1 killer of our dogs. I will always miss my Timo and her sweet smile. Too many of her pals have gone to the Bridge because cancer has claimed them. May they all enjoy green, grassy fields, trees for shade, cool streams for thirst and the love of us all. Thursday, November 17th, 2011 – I’ve delayed coming to Timo’s site because even after 2 1/2 years, visiting here is so painful. I know Timo’s spirit is with me always – I can still feel her lying close by. I just wanted to add a note about a very special birthday gift my daughter, Rena, gave me. After admiring some paintings of pets she has, Rena asked to choose photos of some of the dogs I’ve shared my life with including my dear Timo. It was difficult to make the other choices, but the artist was able to include 8 of my furpals – Cookie (my very first dog), Crackers, Maizie Day, Freddie, Toto, Timo and Quanah and Murphy who are with me now. The painting hangs where I can see it always along with my granddaughter Shira’s painting of Timo. So many memories, most beautiful, some sad, locked in that painting. It is a daily rememberance of how fortunate I’ve been to have so many 4-legged friends. Never forgotten. Special love to you all and extra belly rubs to my special friend, Timo. Thursday, December 23rd, 2011 – Thinking about belly rubs, I just realized something. Quanah never used to like her belly rubbed. Since you went to the Bridge Timo, she always offers her belly to me to massage. It must be your influence – she’s taking on some of your characteristics. Thoughts of you are always with me and perhaps Quanah too. Wednesday, December 28th, 2011 – When do you know it’s time? So many of my friends on BCD are facing the dreaded decision. Every so often there’s a story and a dog that captures your heart. Millie is such a dog. She looks so much like you Timo and perhaps that’s why I feel this strong connection. So I hope you can look in on her, my dear friend, and give her strength to be with her loving human, Nancy, for a bit more time. Love you my Angel. Thursday, January 5th, 2012 – Sad to report that it was Millie’s time to go to the Bridge. I know you will take good care of her Timo. I have always known dear Timo how bravely you fought OSA. But then you were always incredibly brave and stalwart. Before we discovered the cancer, you must have been in excruciating pain, but never once did you balk at anything that was asked of you. I’ve learned so much since your dx and am continuing to learn. Would I have done things differently – perhaps, but hindsight is always 20-20. The amp was a must – it relieved your awful pain almost immediately. Just wanted to tell you again that there is a very special place in my heart and mind where you will always live. I love you my Angel. Friday, July 6th, 2012-Today is another sad day for my family. Omer, my granddaughter Zahava’s Siamese cat went to the Bridge. Omer was ill for a while, but seemed to be getting better. Yesterday my daughter and her family went visiting for a while and when they came home at about 11 pm they found Omer very sick. They rushed to the Animal Hospital where the doctors made every attempt to save this sweet, good-natured 5 year old cat, but were unable to do so. We all mourn his loss. Timo, I know you were never a cat lover, but Omer is special – please help him cross the Bridge and take good care of him. Monday, July 23rd, 2012 – Timo – my brave girl who showed an extraordinary amount of courage in the face of overwhelming pain. Today marks your 3rd year at the Bridge and I still ache for you. You did all that was ever asked of you and more in your almost 9 years. You never wavered until those last hours when you told me it was time to go to the Bridge. Timo, I feel your presence in such subtle ways – a sudden flash of black fur, feeling you rub against my leg and when I look down, nothing I can see with my eyes, only with my heart. Some may doubt, but I know you are there. Thank you Timo for instilling some of your courage in your best pal Quanah. Thank you for the love, the loyalty and the lessons you gave us all. Thank you for being such a good friend to me and to Quanah and watching over her and Murphy and all my other pets. And thanks to everyone at BCD and CC and CCA who supported us through all the ups and downs of your journey. G-d bless. Sunday, December 2nd, 2012 – It’s been a while since I’ve written to you Timo, but you are in my thoughts every day. I worked on yours & Toto’s resting places to make them prettier, although I’m not quite finished. It will be time soon to plant some bushes and I’m thinking of the best ones for you. I know when I leave this house, your graves will be destroyed. But I also know that you and my other pals are really at the Rainbow Bridge waiting for me. In your honor, I adopted a needy dog in September. I call her Cookie, after the very first dog I shared my life with. This Cookie was abused as a pup, was kicked so hard her hip was broken and needed a couple of surgeries. That leg is shorter than the others which gives her an odd walk and a sometimes limp. But we’re keeping watch on it. Quanah keeps her in her place but she and Murphy play daily with Cookie. Cookie is also an escape artist just as you were. I remember when you found your way through the fence to the next-door neighbor’s yard. We had problems getting you out of there because it was a vacant house with a locked gate. Cookie found her way out by digging under the back fence which isn’t strong at all. She always found her way home, but there are so many dangers out there, I was really afraid for her. After several attempts at fixing the fence, we finally came up with a solution – bars and cemented rocks. Cookie isn’t happy but I am. Timo, I miss you always. Thank you for teaching me what courage means, my braveheart. Wednesday, May 29th, 2013 – Just because I haven’t written in a while doesn’t mean you’re not with me every day. Today is a sad day, looking at photos of your last day with me. And the 4th anniversary of that day is coming closer. Your dear friend Quanah senses my sadness as do Murphy and Cookie and lay at my side. I will always miss you my Timo, your head on my lap, lying close to me during storms, protecting me from the nasty neighbors with your growl. Take care of all your new friends, the many pets I shared my life with. Till we meet again…Love always. Wednesday, June 26, 2013– Last night for the first time I saw Toto in my dreams. She was a young pup and when I called out her name, she became alert with tail wagging. And then the dream ended. I hope that this is a sign that she is well again and that you are with her Timo. Odd that I don’t dream about you Timo, even though you are in my thoughts every day. I miss you so. Tuesday, July 23rd, 2013 – Dear Timo – today is your 4th year at the Bridge. Our friends at CCA and BCD have sent supporting notes to help me through this sad rememberance. I do remember our good times and celebrate them, but sometimes the tears come for what we missed. But we didn’t miss the “dance.” My friend Cheryl’s pal, Jersey, is at the Bridge now and I know you will welcome her kindly. My special dear friend, my Timo, I hold you close always in my heart. Friday, March 28, 2014 – I know it’s a long time since I’ve written. But Timo, not a day goes by that I don’t think of you. Your calendar picture is in front of me all the time. Since it’s March, the Canine Cancer Angels calendar has everyone dressed in green hats and ties for St. Patrick’s Day. I love seeing your happy smile. I have a request – please watch over your friend Quanah. Her right ear and right side of her face has been paralyzed for over 2 months and she has other problems. We are taking her to the animal hospital this coming Tuesday for her 3rd visit. I hope with all the antibiotics being forced on her that she’s getting better. I know you’ll do your best and watch over her. It’s all in Hashem’s Hands. Love you always my dear girl. Wednesday, July 23rd, 2014 – Timo, today marks 5 years since you went to the Bridge. I’ve asked my friends at CanineCancerAngels not to mourn, but to celebrate your life with me. I push the bad days, those when we were fighting the cancer together, far back in my mind and those days filled with sweet memories become more vivid. You were my best friend and my teacher. Through you, I learned that each day shared with a loved one is a gift to be enjoyed and treasured. Timo, my dear angel, you are always with me. Poet Thomas Campbell said, “To live in the hearts we leave behind is not to die.” Timo, you live in my heart always. Wednesday, January 28, 2015 – This month it’s 5 1/2 years at the Bridge. Timo, there’s not a day that I don’t remember you and wish you were still here. Your one and only favorite toy sits on a dresser where I honor you. Your friend Quanah is having a lot of difficulty getting up due to problems with her back end. I’m searching for a harness to help her as it’s difficult for me to lift her even with the towel I use. Faye & Gil are in Eilat, so I have all 5 dogs with me. As I was leaving to go to her house to see to the bird and the cats, Quanah became stressed and when I left, she started to bark without stopping. I was only gone 10 minutes but she was so happy to see me, she gave me some kisses. Just as you did. Cookie is a pain in the neck. She refused to come in from the garden last night, so slept outside, her choice. She annoys me when she doesn’t come when called. Quanah and Murphy run to me when I call, but Cookie is a stubborn one. From time to time, I may share stories with you about your friend Quanah and also Murphy and Cookie. I know you’ll look after all the furpals from the other side of the Bridge. I love you! Wednesday, April 15, 2015 – Dear Timo, Last night at 10 P.M., I sent you a very special gift – your dear friend and mine, Quanah, will meet you at the Bridge. I know you will be both happy and sad to see her, but it will be a glorious reunion. While my heart is breaking, I’m glad she’ll have you there and even Toto and all my beloved Angels to welcome her. It brings me some peace to know you are all pain-free and able to enjoy the beautiful land just beyond the Rainbow Bridge. I hope when its my time, I can join you all. I’ll be looking for the pennies. I love you all so much. Thursday, July 2, 2015– My dear sweet Angels, sadly I have to tell you that Pugslie, Rena’s little pug, is on her way to you as of last evening. It was a kindness as she was suffering so. I know most all of you don’t know her and Quanah, I remember how she barked at you, but please welcome her and take good care of her. I will miss her at babysitting times and Rena’s house will be quieter, but at least Pugslie is free of pain now. Timo, it’s close to your Bridge day – just know you and all my angels are always in my heart and my thoughts. Belly rubs and kisses to you all. Monday, July 20,2015– Yesterday was more difficult than most. Shira is going to paint a picture of Quanah on a stone of my choice. Rena took me to the photo shop/post office to choose some photos from my digital camera for Shira to use as guides. It was too much, looking at past photos and I desperately tried to hold back the tears. I chose photos of you Timo, Quanah & Toto, just to hold close to me. Timo, your Bridge date is close, July 23rd. Saturday night, we all wMill be lighting candles around the world remembering all our Angels. I hope you all see the candles I light especially for you. Always in my heart and thoughts. Belly rubs, kisses and pats for all my Angels. Thursday, April 14, 2016– My heart is very heavy today. My dear Quanah has been at the Bridge one year. I haven’t posted in a long time, but not a day goes by that my Angels are not remembered. Quanah, do you remember how I used to dig my face in your fur to smell your sweetness? You were and always will be, my special pal, my protector and I will always feel you close to me. My heart is filled with remembrances of you. I hope you celebrate your freedom from pain today with all your dear friends. Always thinking of you and sending tons of kisses and belly rubs. I love you. Tuesday, May 10, 2016 – Last night I had a beautiful dream of you Quanah. You jumped on the bed with me and we were snuggling until I woke up. The dream left me with such a feeling of peace. Thank you for sending me such a wonderful penny. You and all my angels will always live in my heart and daily in my thoughts. Sending you all love until we meet again. Monday, August 1, 2016 – I know it’s past the date of your Bridge anniversary Timo, but I haven’t written because I was depressed. Your anniversary and my Dad’s are the same day, your 7th year at the Bridge. Your picture is always in front of me, but I don’t need it to remember you. I think of so many things, like the spots you used to lie down in (Cookie claims them now), how you would “talk” to me, how you would lay your head on my lap hoping for a treat, playing with your best friend Quanah, when a storm was brewing and you came to me for comfort and against all the “experts” advice I would pet you and tell all would be well. I hope you and Quanah are still playing together, enjoying with all the Angels. Always in my heart, sending you my love.